After the success of Manor Farm Fisheries, Mr Keightly and I headed to a local lake where Mark has had some good Carp success, Crystal Lakes in Fenstanton. They have three lakes to pick from, the Prize Lake, Lake "A" and Lake "B". A lovely lilly lined swim face me with plenty of options, either far out or either side of the lillies. We used the trusty bait from the previous day, namely red maggots, hemp, Mark's super secret groundbait, corn and meat. 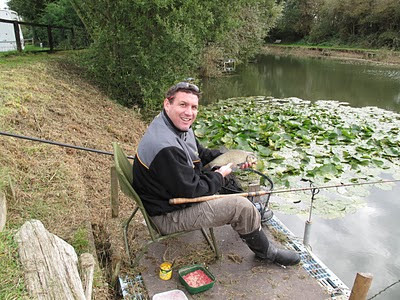 I took Friday 15th October 2010 off work and headed down to Manor Farm Fisheries, to fish the Becks Lake with very good friend Mark Keightley, aka "matey". I did borrow quite a bit of terminal tackle from Mark including something to sit on... Thanks matey! We decided to fish a double swim, which was a lot more sociable than being in separate swims, plus we could help each other out in case of big fish... or birdlife... more about this later. We tackled up and started fishing about 8am. Mr Keightley had brought us some red maggots, all sorts of bollies, hemp, sweetcorn, good old spam and his home made ground bait made from trout pellets and crumb plus other offerings. I decided to start with a simple insert waggler set-up and Mark set up the first of his Carp rods.